Supporters of the donkey project never cease to amaze us with great ideas. We are also fascinated by the fact that friends of the project are of all age groups, and that many children and teenagers are sparing no effort in helping us. The artist Giuseppe Madonia from Palermo, now living in Berlin, donated more than 20 of his works to people willing to donate money for a donkey for a single mother. Maria Otz-Buchner from Ringgenberg (Switzerland) organized an information campaign with the help of a book shop and various Swiss and Eritrean friends. They offered paperwork donkey legs, donkey ears, donkey stomachs ... - until we had an entire donkey herd. Some ask for donkey donations as their birthday or wedding presents. An artist from Hamburg supported the project even beyond her death. She asked for donations to the project instead of the usual flower wreaths. Flea markets, cafés in school events, a Christmas Lottery and Christmas Bazaars. Doris Leitner from Stuttgart organized a motorcycle tour for the donkey project. Students at the Reinhold-Schneider primary school in Freiburg collected 600 € for the Esel-Initiative: selling pastries at school, mowing lawns in the neighbourhood, selling handmade postcards and popcorn, collecting at local homes, an open day and many other ideas. One school class repaired bicycles and used the income to buy donkeys for Eritrean mothers. The Henry-van-Velde school in Hagen (Westphalia) created a water race track and took 50 Cents from race participants, financing several donkeys with the race. The children of class 4a of the Alt-Lotte primary school in Ibbenbüren (Westphalia) put grey donkey ears on their heads and collected money for four donkeys at a school celebration. The high school in the town of Frechen (near Cologne) founded a support group for the distribution of donkeys in the Tsorona region. The German Green Party's local council in Altötting (Bavaria) organized a collection of paper for recycling benefiting Eritrean women. Several One World Shops donated their annual surplus to the Esel-Initiative. The Tourism Council of the city of Esslingen (near Stuttgart) collected donations on International Water Day. On three evenings, the Ohregano Choir from Lüneburg collected donations for an entire herd of donkeys. On several occasions, furniture removal firms in Berlin have donated some of their income at the end of the day, so that women in Eritrea may carry less. Ole Otten, a student of class 6c of Ritterhude (near Bremen), spotted a small ad of the Esel-Initiative in his mother's newspaper. He found the web site on the internet and then mobilized his family and his school. Finally, he and his school friends alone had collected for more than ten donkeys between them. The list could be considerably longer if we knew of all your ideas and projects. Often we discover donations of uneven amounts, and then we think somebody has organized an event and collected for the project. But, regrettably, we do not always find out about the event. 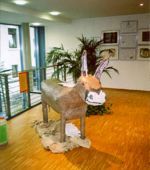 Using their hand made donkey, 7th grade students in Michelstadt collected 270 Euro. Students at Clara Fey Highschool in Schleiden show the play "Askalu wants a donkey". In Oberhausen, girls of 8 to 12 years painted this lovely 1 x 1 meters donkey during their holiday camp. A local doctor bought it and donated one donkey. 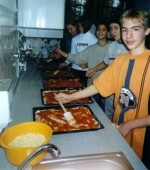 Students of classes 6b and 7d at the Clemens-August primary school in Brühl (near Cologne) were baking and selling Pizza for weeks, until they were able to donate 500 Euro to the Esel-Initiative. The children of the Fledermäuse kids' club in Lohmar (near Cologne) made this huge donkey out of paper and collected money for 14 donkeys.